New England defensive end Trey Flowers (98), who has a team-high seven sacks this season, became a starter midway through the year. FOXBOROUGH, Mass. - Their stories of breaking into the league are quite similar, but they happened nearly 10 years apart. Rob Ninkovich was drafted in the fifth round in 2006 and was eager to contribute right away for the Saints, but a season-ending ACL injury early in the season hindered all the momentum he had built up. The Patriots took Trey Flowers in the fourth round in 2015, but he played one game last year while dealing with a lingering knee injury. Ninkovich eased his way into the league the next few seasons, but once he came to New England and got playing time in 2009, everything clicked and he jump-started his career. Flowers' ascension to a standout player happened more quickly, and he earned a starting role midway through this season. When Flowers was down last year, Ninkovich served as a voice of reason. He told him that he just had to be patient, and his time would come. He was right. Now Flowers, a 6-2, 265-pound defensive end out of Arkansas, hasn't just become one of the Patriots' better pass rushers. He's also become their best, from a results standpoint, at getting to the quarterback - racking up a team-high seven sacks this year heading into the Super Bowl on Feb. 5 at NRG Stadium. Ninkovich noticed Flowers' potential right away, so he's not surprised to see him shine on the biggest stage. "It's real frustrating, especially when you get into the playoffs and you want to be there," Ninkovich said. "Trey's done a great job of rehabbing, coming back, getting into the program and hitting the ground running." Ninkovich said Flowers is built perfectly for playing on the edge and wreaking havoc inside. He may not be the biggest guy out there, but his long arms help him shield off defenders so they can't hold him, Ninkovich said. He said the most impressive part of Flowers' ability to get to the quarterback is that most of his sacks come from the inside, which is less common. He also praised Flowers' technique and drive. Flowers isn't going to talk too much, Ninkovich said, but he's always paying attention and learning. Even when he was sidelined last year, rather than sulk and feel sorry for himself, he was absorbing information daily. After admiring his natural skill set, work ethic and desire to be great from afar for a year, Ninkovich is thrilled to see Flowers excel in big games like he knew he could. "His future looks bright," Ninkovich said. The future and present have often looked bright for Flowers, and last season was the first splotch on an otherwise clean path to success. He started playing football in Huntsville, Ala., at age 7, and he worked his way up to Arkansas and eventually the NFL. He wasn't used to unexpected hiccups, which made last year even more difficult to digest. "It was something that was hard to deal with, sitting out a year," Flowers said. "It was my first year sitting out since I started playing, and it was tough being on the outside looking in." But he learned to never take playing football for granted. He knew that when he got back - whether it was that season or this one - he would make the most of it. He didn't pity himself, but he constantly thought about where he was and where he wanted to go. Now that he's had so much success this year, Flowers is a household name for Patriots fans. Last year, he was just another guy trying to make it in the NFL. This year, he's a standout contributor on one of the NFL's best defenses. 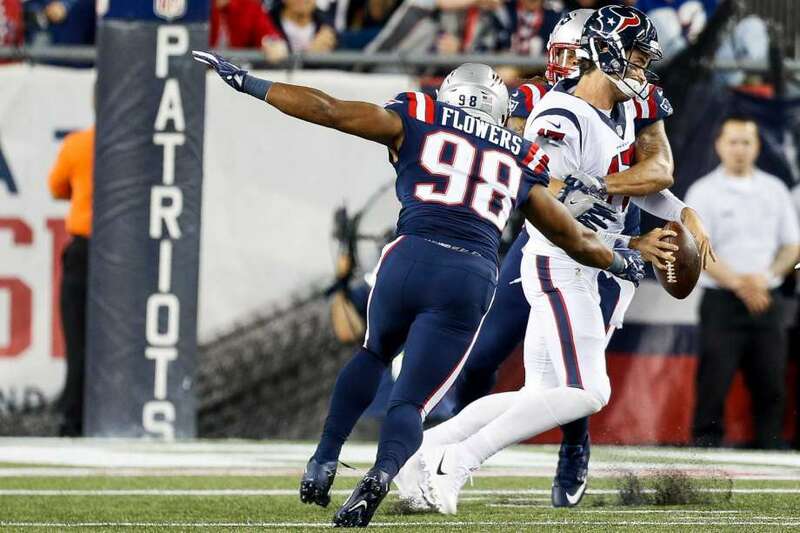 "He's definitely coming into his own, making big plays," said defensive tackle Alan Branch, whose locker is next to Flowers'. "He's a huge part of our defensive front and he's always working on getting better." As the season winds down, and Flowers approaches the biggest game of his life, he thinks back to where he was as a rookie. What was tough at the time is now a distant memory, and he's eager to help the Patriots earn a win over the Falcons. He's amazed at how much can change in a year. "It's definitely a dream come true," Flowers said. "It's something you work hard for your entire life, and now you're finally there. You've just got to not make the moment too big and give it everything you've got."